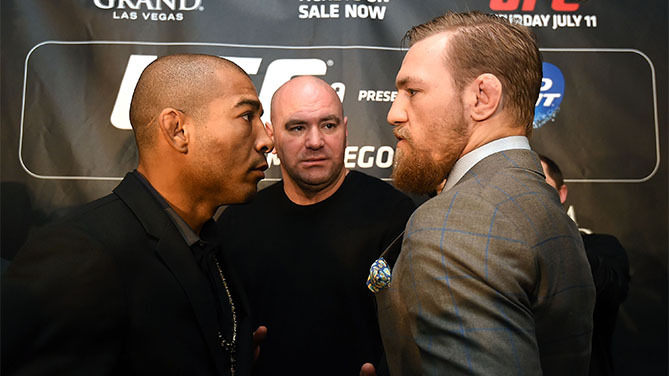 Jose Aldo and Conor McGregor will finally settle the score on Dec. 12 in Las Vegas when they meet in the most anticipated clash in MMA for the undisputed UFC featherweight title at the MGM Grand Garden Arena in the main event of UFC 194. Originally scheduled for UFC 189 on July 11, an injured rib forced Brazil's Aldo out of the bout, paving the way for Ireland's McGregor to defeat replacement opponent Chad Mendes via second-round TKO to take the interim 145-pound belt. Now back to cement himself once more as the best featherweight ever, Rio de Janeiro's Aldo, unbeaten in 18 fights dating back to 2005, will face off against the charismatic Dubliner, whose rise to the top has captivated the sports world. But this is more than just a championship fight, as the two have engaged in a series of heated encounters over the course of a worldwide media tour, making this one of the most personal matchups to ever grace the Octagon.